Are you looking for homes for sale in the Burning Tree ES district ? Just click here to see all the homes for sale in the Burning Tree ES district. Burning Tree Elementary School opened in 1958 with eight classrooms, but it didn’t stay that size for long! In the fall of 1977, Fernwood Elementary and Whittier Woods Elementary were closed and consolidated with Burning Tree. The building was modernized in 1991 and relocatables were added so that the school now houses twenty-eight classrooms situated on a wooded 6.8 acre site. A gymnasium addition was completed in the summer of 2007. There are lots of reasons to look for homes for sale in the Burning Tree ES district. There are fewer than 500 students at Burning Tree and the student teacher ratio is 14 to 1. 90% of the teachers have 3 years or more of experience. Students at Burning Tree score well above the state average on standardized tests and the school gets a 9 from GreatSchools.org! Burning Tree is a diverse and inclusive community. Students come from over 50 countries, and ESOL and a learning center are open to make that transition easier. The student body reflects the diverse community of home owners and renters that surround the school. It scores a 10 on the diversity scale at Greatschools.org. Not only is the school renovated and attractive. It also has nice grounds. Another important and special part of the Burning Tree School is the Malden Memorial Garden, which was dedicated in June, 1995. It is an outdoor living classroom where students can reflect, engage in class discussions, sketch, or even have an impromptu picnic. The garden has been the setting for the release ceremonies for second graders’ butterflies after they have emerged from their crysalises as well as the location of the beds where students have planted bulbs in conjunction with their study of living things and participation in the Journey North Project. The garden was created as a memorial to a second grade teacher, Mrs. Renay Malden who died in 1993. Funds for this beautiful garden came from the Burning Tree PTA, the Malden Family, the Bender Foundation, and other private contributions. It is lovingly maintained by parents, staff and students. The Burning Tree staff and community work closely together to focus on the whole child. Opportunities are available to the students to explore their artistic side, their athletic side and their STEM side. Recent grants include a Poet in Residence and an Artist in Residence from the Maryland State ArtsCouncil, and this year Burning Tree will become a National Audubon GreenKids school. The school’s non-competitive Science Fair provides a venue for judges from the National Academy of Sciences and other scientists to provide feedback to the students. Lunch with a Scientist brings doctors and scientists to every classroom to discuss their work. Arts Night, International Night, numerous choral, instrumental music and physical education activities and an incredible assortment of before and after school activities enable our students to develop their creative and physical skills right at school. Last year the school put on a musical, “Alice in Wonderland. Burning Tree was the first elementary school in Montgomery County to have a First Lego League team. Now in its third year, fourth and fifth grade members meet weekly (or more) with engineer mentors from the Naval Surfaces Warfare Center at Carderock to conduct research and build and program robots that solve problems. Lego League team members have competed in both the First Lego League Maryland State Competition and the Southern Maryland Robotics Challenge and have won numerous trophies in the following categories: overall achievement, technical interview, programming and team work. Outreach efforts have been made to include more girls, and the present Lego League team includes over thirty students. and the administration. The parents are active, involved, and ever present throughout the school, adding up countless volunteer hours. 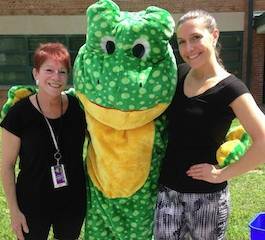 The school/PTA partnership includes parent coffees, cultural arts assemblies, numerous community service activities that provide food, resources and money to charitable organizations and its sister school, Broad Acres ES. Last year the SGA donated nearly $5000 to Save the Children in both Haiti and Chile, and to the National Brain Tumor Association. 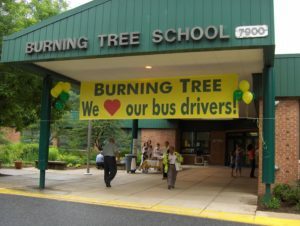 Over 85% of Burning Tree families are members of the PTA. The homes are a variety of colonials, split levels and ramblers built in the late 50s and early 60s. In addition, some of the older homes are being torn down and replaced with larger homes like the popular Craftsman homes or colonials and a few contemporaries. If you want to see the homes for sale in the Burning Tree ES District, just click here. This is a popular area of Bethesda because it is close to the Potomac River and the C&O Canal which make it perfect for bike lovers and kayakers, dog walkers and runners! It is also easy to get into the city from this area with access along River Road, Massachusetts Avenue, Wisconsin and Connecticut plus the Beltway and Clara Barton Parkway. Access to all the local airports is easy and the proximity of I-270 means that you can get up into the northern part of Montgomery County quickly! If you would like to live in the Burning Tree School district, give the Lise Howe Group a call at 240-401-5577. There are many homes for sale in the Burning Tree ES district that you would love to call home. Just click here to start your search!